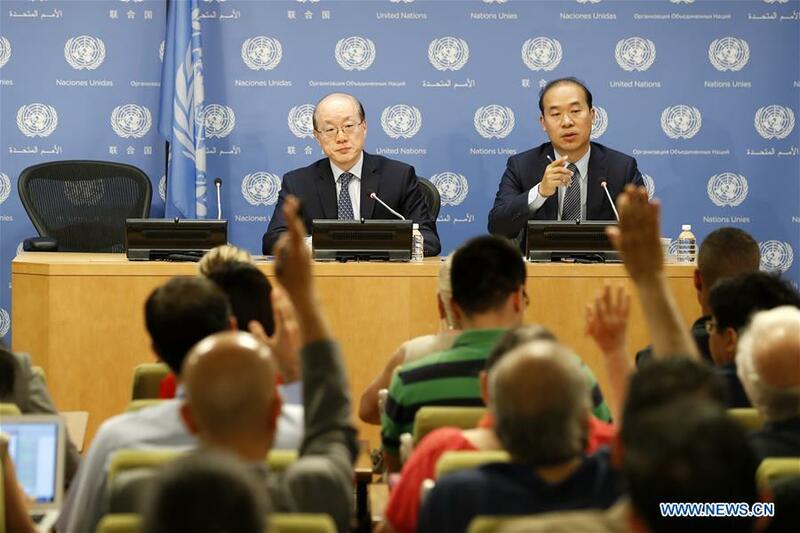 UNITED NATIONS, July 3 (Xinhua) -- Ambassador Liu Jieyi of China, UN Security Council president for July, said on Monday that issues of Syria, Yemen, South Sudan, Colombia, Haiti and Cyprus will be on the agenda of the 15-nation council in July. As for Syria, the crisis faced a "crucial month for the political process" with talks in Astana, Kazakhstan followed by resumption of the Geneva talks later in the month, he said. "The council is following keenly the developments in this respect." The ambassador said there were "three dimensions" to be addressed by the 15 members of the council on Syria -- the political, the chemical and the humanitarian. "These two aspects will also be under review in the Security Council." The reference to chemical was for the alleged use of chemical weapons in Khan Sheikhoun in north-western Syria in April, which killed more than 80 people. A report last week said such weapons had been used but did not say who used them. On Yemen, he said, "the council will look at the situation and hopefully will work to persuade the different sides to the negotiation table to seek reconciliation, to seek to solve the problem through political means and to abandon the notion that there is a possibility of a military solution." Liu addressed the denuclearization of the Korean Peninsula, even though not formally listed on the council's July agenda. He reiterated the Chinese "suspension for suspension" proposal package -- suspension of nuclear and ballistic testing on the part of the Democratic People's Republic of Korea and suspension of the military exercises on the part of the United States and the Republic of Korea. "This is a feasible proposal because it accommodates all of the major parts that confront the region and we do believe that once we embark on the road of negotiations along the lines of these proposals and ... we will be able to calm things down and to seek a lasting solution of denuclearization and peace and stability on the Korean Peninsula," Liu said. "We do hope that the other parties will be more forthcoming on accepting and supporting these proposals." On South Sudan, Liu said that the crucial thing is to achieve reconciliation among the different parties and also to have an effective dialogue for lasting solutions. "The council will continue to urge different sides back to dialogue to cessation of whatever hostilities still exist and also to work out a lasting solution that is best for the country and the people," he said. Liu anticipated that Security Council members would establish a second political mission for Colombia to "monitor the implementation" of final agreements between the government and the rebel group FARC and the extension of mandates for the UN Peacekeeping Force in Cyprus and the UN Assistance Mission for Iraq. "On Colombia there will be adoption of a resolution ... by consensus and to lend its political and other support to the Colombian government and people for implementation of the agreement and to put an end once and for all to conflict in the country," he said. "This will be important not only for the country and the region but even for the world." With talks continuing over the long-divided Mediterranean isle of Cyprus, the ambassador expressed hope of progress with the council possibly giving them a "boost for more fruitful results." Liu said that he hoped to follow what the Bolivians did in June as president of the council and precede what the presidencies of Egypt and Ethiopia are expected to do in August and September and that is to hold open debates on Africa and the African Unions. He sees "four months generating more political momentum to help Africa enhance areas of peace and security, because we, speaking for China, are of the view that we should always provide more help to Africa to seek solution, for Africa problems by African countries in African ways." Liu said whatever focus the council "can bring to this issue of enhancing capacity-building in Africa should serve a very good cause for not only peace and stability in Africa but also for peace operations throughout the world." To that end, the ambassador announced the council would hold two open debates -- where all members of the United Nations may participate -- on "enhancing African capacities in the areas of peace and security" and on the Mideast, namely the Israeli-Palestinian problem. He intended the presidency of China to be "objective and impartial ... transparent as the council will like us to be and certainly will try to arrange the work of the Security Council in an efficient and effective way."